The root of the vine bush plants Morinda officinalis How. of family Madder. Mainly produced in Guangdong, Guangxi and Fujian provinces in China. No smell, sweet and slightly astringent. Sturdy strip, necklace form, thickness and purple. Removed the wooden core, unprocessed or stir-baked with salt solution. Sweet, pungent, slightly warm; kidney and liver meridians entered. Tonify kidney yang, strengthen tendons and bones, dispel wind-damp. 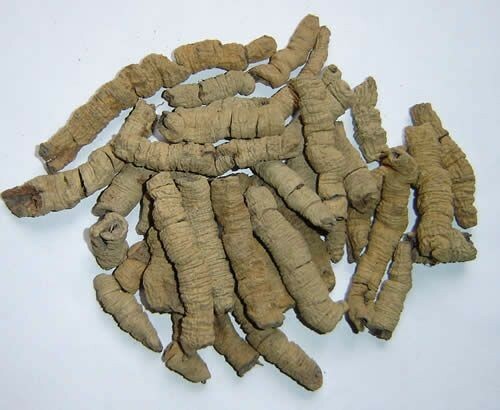 It is indicated for impotence, seminal emission, sterility due to cold in womb, frequent urination, cold and pain in lumbar and knees and other symptoms caused by kidney yang deficiency, because it can tonify kidney yang, strengthen tendons and bones, and it is warm and sweet without dryness in properties. 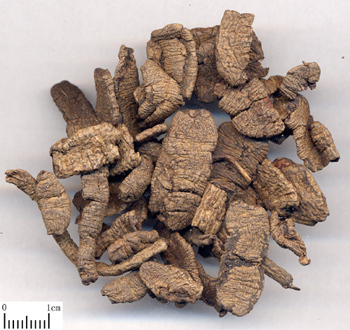 For it is mild in actions of tonifying kidney yang, it is combined with other herbs to tonify. For impotence and sterility due to kidney yang deficiency, insufficiency of fire of life gate, it is combined with kidney-yang-tonifying and kidney-essence-supplementing herbs, for instance, it is used with Yin Yang Huo, Xian Mao, Shu Di Huang and Gou Qi Zi in the formula Zan Yu Wan from Jing Yue Quan Shu. For deficiency cold in lower energizer, sterility due to cold in womb, irregular menstruation and cold-pain in abdomen, it is combined with herbs of warming kidney and liver, dispelling cold and relieving pain, for instance, it is used with Rou Gui and Gao Liang Jiang in the formula Ba Ji Wan from Tai Ping Hui Min He Ji Ju Fang. It is very suitable for chronic arthralgia, weak tendons and bones due to the disease affecting liver and kidney, or kidney yang deficiency with weak tendons and bones attacking by arthralgia, because it can dispel wind-damp, tonify kidney yang, and strengthen tendons and bones. It is commonly combined with herbs of tonifying kidney and liver, strengthening tendons and bones, and dispelling wind-damp. For flaccidity of bones, soreness and limpness of lumbar and knees, it is combined with Du Zhong, Rou Cong Rong, Tu Si Zi and Bi Xie in the formula Jin Gang Wan from Zhang Shi Yi Tong. For excessive inner cold-damp, atrophy-flaccidity of tendons and bones, cold and pain of lumbar and knees, it is combined with Fu Zi and Niu Xi in the formula Ba Ji Wan from Sheng Hui Fang. Decoct 10~15 g. Stir-baked with salty solution for tonifying kidney and raw for dispelling wind-damp.